From all across social media, clear bags have been popping up faster than freshly baked cookies in the oven. Are these bags chic? Or could they be simply novelties? The clear PVC reminds me of those clear makeup bags. Remember those? That being said, when it comes right down to it. Fashion has always been spontaneous. And to the average onlooker, it may appear to be a clown act some trends. Fashion at times, is not always meant to be practical. Experimenting with fashion, means you can have a lot of fun. Why take fashion, or life to seriously right? The clear bags are not a new it thing. In fact, the style itself goes back to some retro areas. Take Elizabeth Taylor, for example. She was always a massive fan of the clear bags for style purposes. 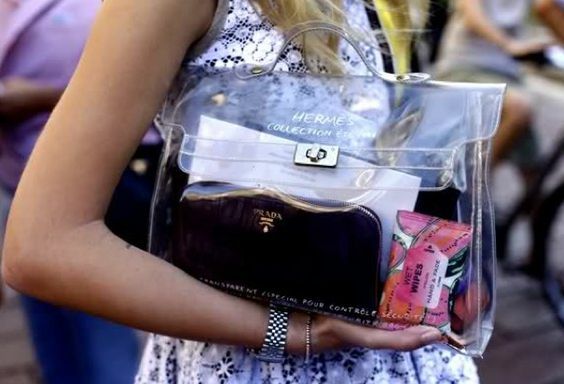 And now transparent bags are being adopted into the new style trends for 2018. 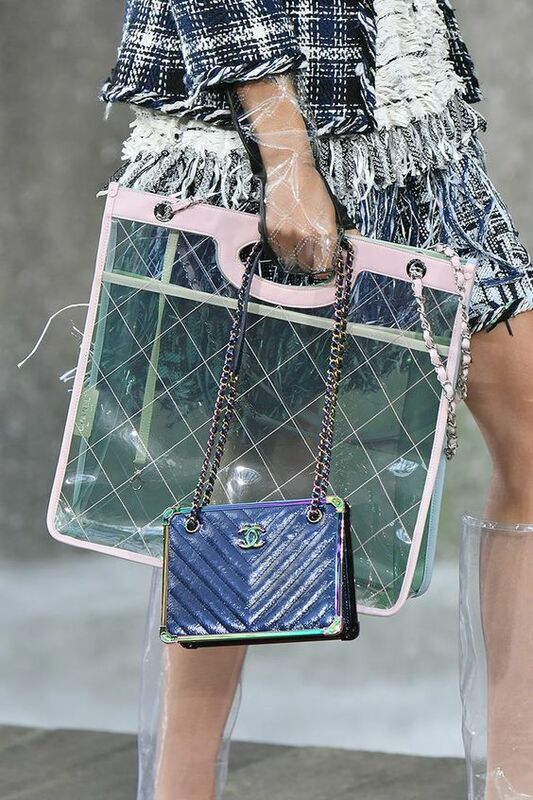 Karl Lagerfeld, created clear bags, boots, and rain hats for Chanel’s 2018 Spring Collection. The more I looked at them, I found them to be quite charming in a fun way. Sure, not everyone will be a fan of showing off what they carry in their bags on a daily basis. Who wishes to see your tangled-up headphones, or any other unusual accessories? Wearing a clear bag can bring out the artist in you, and have you get creative with your styling choices. Whether you’re picking out brightly coloured pouches to organise your plastic bag or finding a muted palette to go with your neutral shoes. If you enjoy putting a look together, you can really go to town and get super creative. The most popular styling is people showcasing their designer purses, card cases, and wallets in their clear bags. It shows off your eyes for design without being too flashy in a bad way. As lovely as this style maybe, you don’t have to shell out a lot of money to achieve this look. 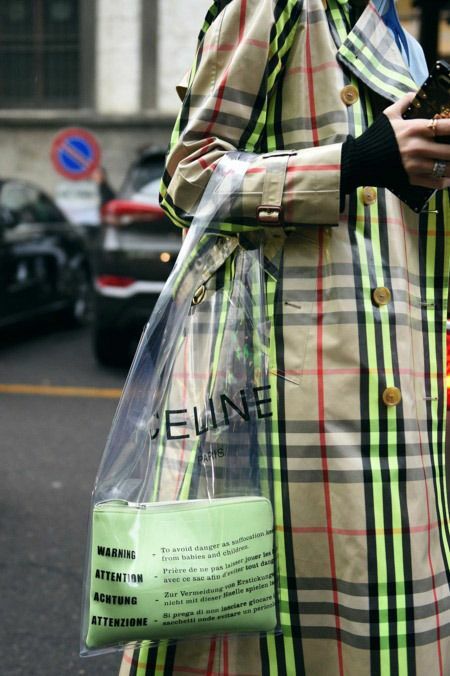 A lot of unknown brands are selling these plastic purses for a lot less. So, you don’t have to sacrifice a lot to still look incredibly stylish. 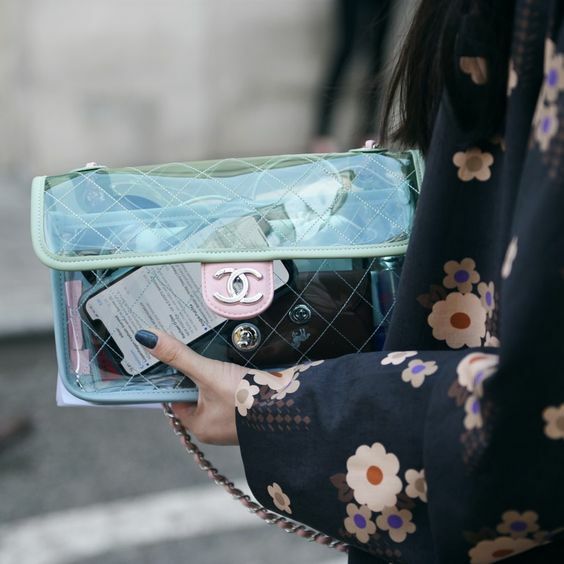 For some, a clear bag isn’t necessarily the easiest accessory to pull off-it puts all of your stuff on display rather than stashing it away from prying eyes, for one. If you are going to a rugby, football, or hockey game (where some arenas have policies that require you to have a clear bag), well, that is kind of the point, but on a typical basis the style has circulated well beyond game season. One thing to note if you intend to use this style of bag on a daily basis. You must realise, it gives potential robbers, the golden opportunity to see exactly what you have in your bag. Whether, it is your mobile, card cases, and of course money. That is why it is best to avoid the tote styles, and instead buy a PVC cross-body instead. This way your content is safe across your body and your hands are free to roam the city. 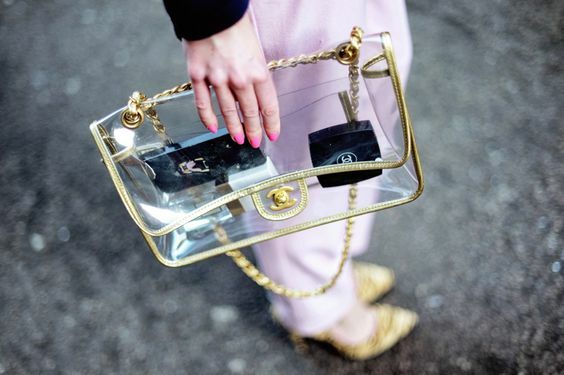 Several designers have rendered their signature handbag silhouettes in transparent materials recently, rendering most popularity among the street style set, both for the striking bags themselves and for what’s inside. Fashionistas tend to choose what they bring strategically- bold cosmetics with pretty packaging, chic sunglasses, and logo purses. This trend maybe fun, or cause you to run with horror. But the question remains, would you rock this look? Check out some more styles below and how you can wear this trend to. For really great deals on chic designer bags for less, check out Fashionphile.